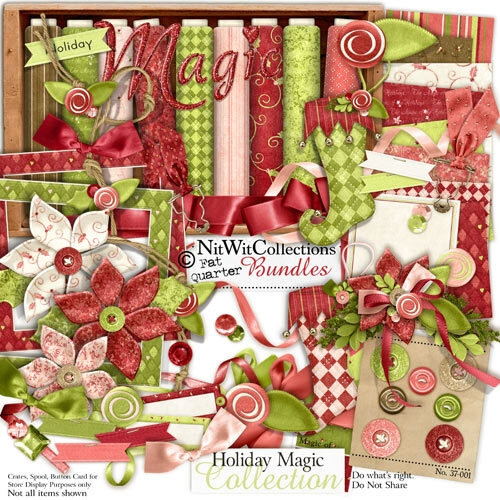 My "Holiday Magic" Collection is yet another in this series! Can ya tell I like the holidays, folks?!? hahahahaha Ooooh but I do and I just can't seem to help myself this time of year but to create holly, poinsettias, mints, and garlands! hahahaha This kit is full of all those beautiful trimmings to help make your cards, layouts, present tags, and heck, even wrapping paper (should you be so inclined haha) shine! hahahahaha Hope it puts a sparkle of magic in your holidays too! Enjoy every moment of the season, folks!